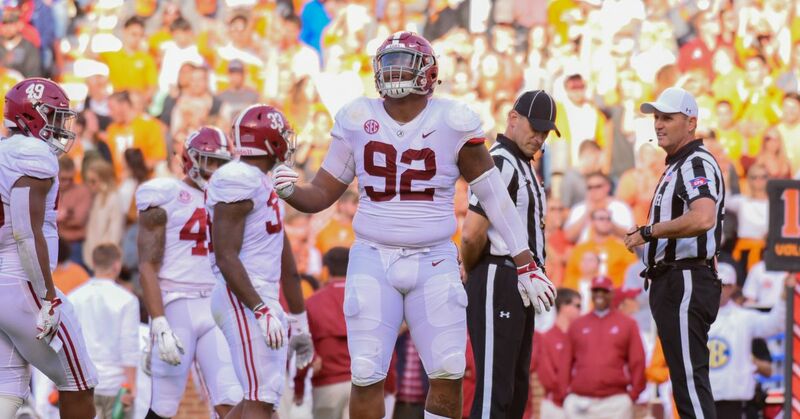 That defensive line will have the attention of pro scouts on Saturday night as they hone in on the top prospects for the 2019 NFL draft . He’s been Alabama’s starting running back since 2016 but barely played because of “internal reasons,” according to head coach Nick Saban. The Butkus Award semifinalist is suspended for the first half for a targeting penalty against Mississippi State quarterback Nick Fitzgerald . The rangy junior is the leader of Alabama’s defensive backfield this year and his draft stock is sky high. At 6’5 and 301 pounds, Williams isn’t the biggest or most imposing offensive tackle, but he plays with good hand usage and power. Fellow linebacker Anfernee Jennings also missed time last season, suffering a gruesome knee injury in the Sugar Bowl .